It’s been 17 years since “9/11.” No doubt, you remember where you were on that day. Images of heroic first responders are etched in our memories forever. Exactly how has the health of survivors and first responders (including firefighters) at Ground Zero been impacted? Are there more firefighters with cancer than in the general population? One recent study (1) estimates 2960 new cancer cases in the WTC-exposed cohort between January 1, 2012, to December 31, 2031. This means that in the future we can expect to see greater numbers of WTC-exposed rescue and recovery workers, including firefighters with cancer. It’s still hard to find clear statistics. Collecting data takes decades, so we won’t know for many years, the full cost they paid that day. 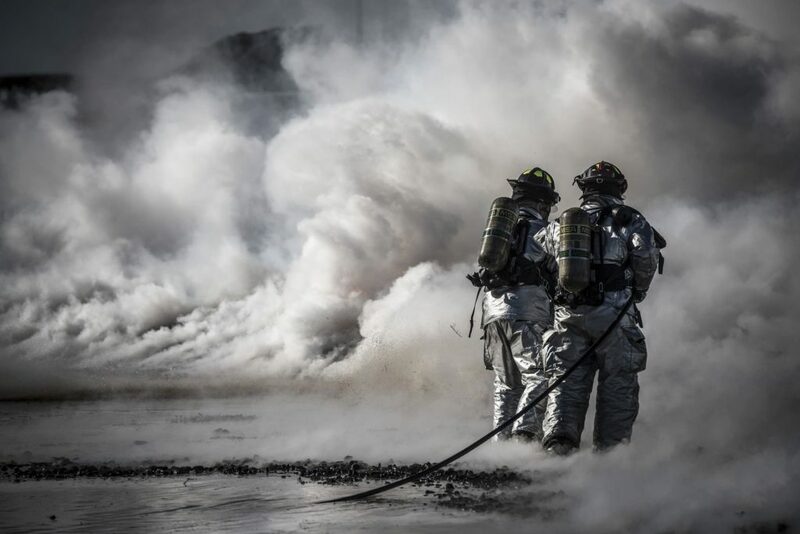 But, we do know that firefighters, police officers, EMT’s, construction workers and volunteers were exposed to over 80 health risks including lung diseases, mental illness such as PTSD and cancers like multiple myeloma (2). It’s also clear that there are increased numbers of firefighters with cancer in general, beyond the World Trade Center Responders. Check out the video at the end of this article. Dallas Firefighters share their cancer experiences. You put on your gear. Manufactured used special chemicals to make it flame retardant. You go into a burning home and get everyone to safety. The chemicals in the smoky air surrounding you stick to your gear. Fire after fire, they accumulate. After the fire, you toss the gear in the back of your truck. Your dirty gear and helmet are a badge of honor within the firefighting culture. The soot and grime show that you’ve seen a lot of fire. Frequent washing causes rapid deterioration of your gear. That means replacing it more often, which means an increased budget. Many fire departments don’t require annual physicals beyond the initial hiring physical. (3) These physicals are crucial for preventing the #1 cause of death in firefighter, heart attacks. But they’re also essential for firefighters with cancer to get early cancer detection. The fabric in the gear, itself, is made with Terephthaloyl Chloride and p-Phenylenediamine. (4) This has a toxic component called C8. To protect firefighters from the heat while fighting fires. In Europe, where it’s illegal to manufacture goods with known carcinogens, they use a component called C6 in their gear. Why don’t we make our fire gear in the US with C6 rather than C8? Perhaps because C6 costs exponentially more to make. While fighting fires, your body temperature rises, increasing the rate of absorption of chemicals into your system. Chemicals like the C8 in your gear and chemicals that have accumulated from the fires themselves. Remember how you tossed that gear in the back of your truck? The chemicals that have accumulated off-gas carcinogens. This is one of the reasons it’s important to decontaminate your gear and your body before leaving the fire. Another reason is that you don’t want to put your family at risk by bringing those carcinogens home with you. Cindy Ells started the International Firefighters Cancer Foundation after she noticed too many firefighters with cancer in the Maryland Fire Service. In her presentations, she cites research that says, firefighters are more than 100 times more likely to get cancers such as Multiple myelomas, testicular cancer, and blood cancers than the general population. How can we reduce the number of firefighters with cancer? Clean that gear well after each use. Communities need to make funds available for the firefighters who protect them to have enough of the right gear. Departments should require annual physicals. If you are or know. a firefighter who’s been diagnosed with cancer, get in contact with the Firefighter Cancer Support Network and request assistance. They will stick with you from your diagnosis and through the battle. They have volunteer mentors who can share their experiences facing cancer and give you valuable resources through the recovery process. If a doctor diagnoses you with one of the more than 80 diseases covered by the World Trade Center Health Program and you are eligible, apply HERE. Thanks for sharing such beautiful information with us. I hope u will share some more information about firefighters with cancer. Thank you, Jony. Firefighters are some of the bravest people around. It’s important to protect them in every way possible, including from cancer. Have a wonderful week! Thanks, Jony. Have a wonderful week!